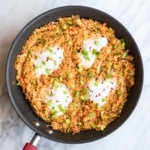 Low FODMAP Nasi Goreng – my one-skillet FODMAP-friendly take on a popular Indonesian dish. It’s gluten-free, dairy-free and mostly plant-based with vegan swaps included. 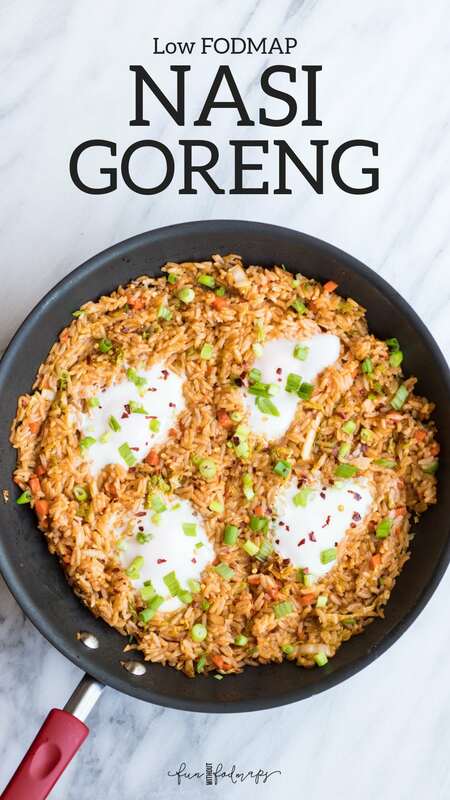 Friends, I’d like to introduce you to nasi goreng (aka Indonesian fried rice). Prior to yoga teacher training in Bali, I had honestly never heard of this delicious fried rice dish. It’s a little sweet, a little spicy, super filling, and full of Asian-inspired flavors. My kind of comfort food. Yum!! In Bali and Indonesia, you’re probably not going to find a one-skillet version of nasi goreng. In fact, it was typically served as a mound of flavorful fried rice with a fried egg, shrimp crackers, fresh veggies, and maybe another protein food (like tempeh or chicken). To me, lots of components likely equal lots of dishes. 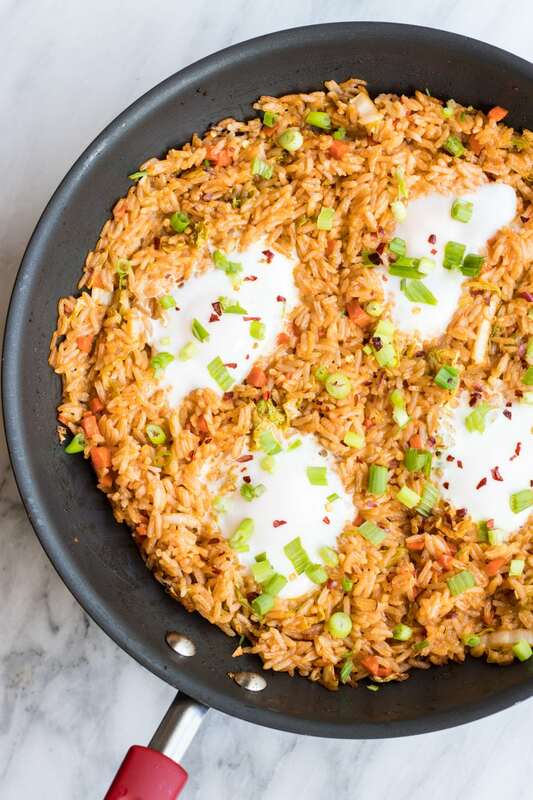 So, I decided to use the same flavors with a few FODMAP-friendly swaps and transform this dish into a time- and dirty dish-saving one-skillet low FODMAP nasi goreng. For many of my recipes, I try to include generic ingredients that you can readily find in most grocery stores. 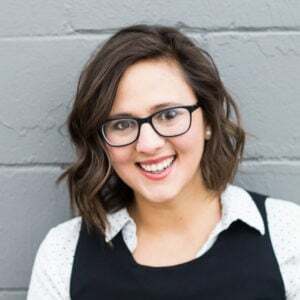 In fact, many of the groceries for my recipes are coming from my small-town grocery store serving a community of 5,000 or Aldi which can have a limited, and sometimes inconsistent, inventory. There are obviously exceptions – most notably garlic-infused olive oil, macadamia milk (my fave!) and Asian ingredients, like Sambal Oelek used in this recipe. I found my jar of sambal oelek at a larger grocery store in the Asian foods section, but you can also order it online. It’s made by Huy Fong, the same company that makes sriracha in the US. Just double check to make sure it says Sambal Oelek and not ‘Chili Garlic Sauce’. They’re in similar looking containers, but the latter has garlic. Although it hasn’t officially been tested by Monash, sambal oelek is made from only low FODMAP ingredients. 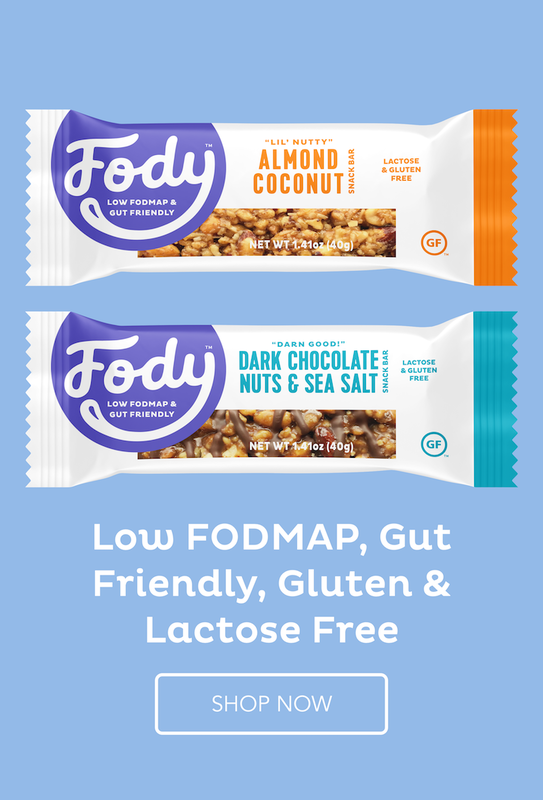 Therefore, it should be okay in small amounts on the low FODMAP plan. However, chiles and peppers do contain capsaicin which is a naturally-occurring compound that contributes to their spiciness. Capsaicin may be a non-FODMAP trigger for some individuals with IBS. 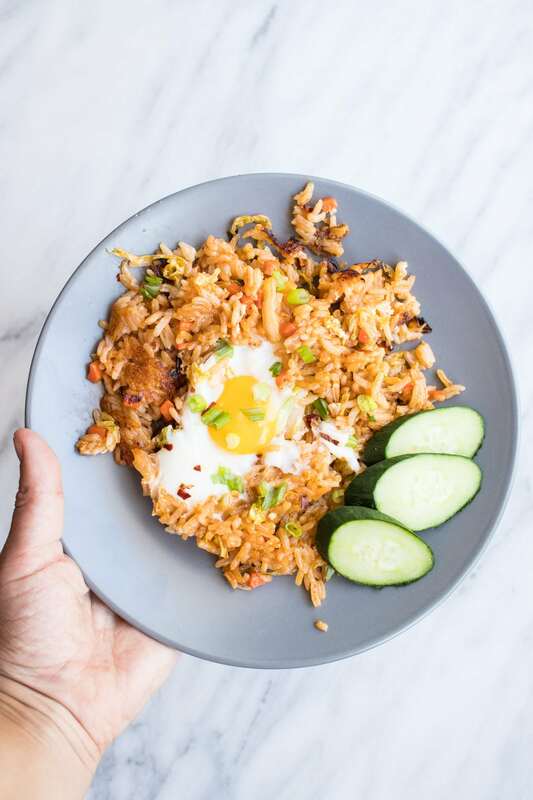 Low FODMAP Nasi Goreng – my one-skillet FODMAP-friendly take on a popular Indonesian fried rice dish. It’s gluten-free, dairy-free and mostly plant-based with vegan swaps included. In a small bowl, whisk together tamari sauce, olive oil, tomato paste, brown sugar, optional fish sauce, and sambal oelek. Adjust flavors, to taste, and set aside. Heat cooking oil in a large frying pan over medium-high heat. Once hot, add diced carrots and cook for 3 minutes. Stir in shredded cabbage and cook 1 minute more. Add sauce and leftover cooked rice. While continuing to cook, stir everything together until rice is well-coated with the sauce mixture. If omitting eggs, cover rice mixture and continue to cook until rice is hot. 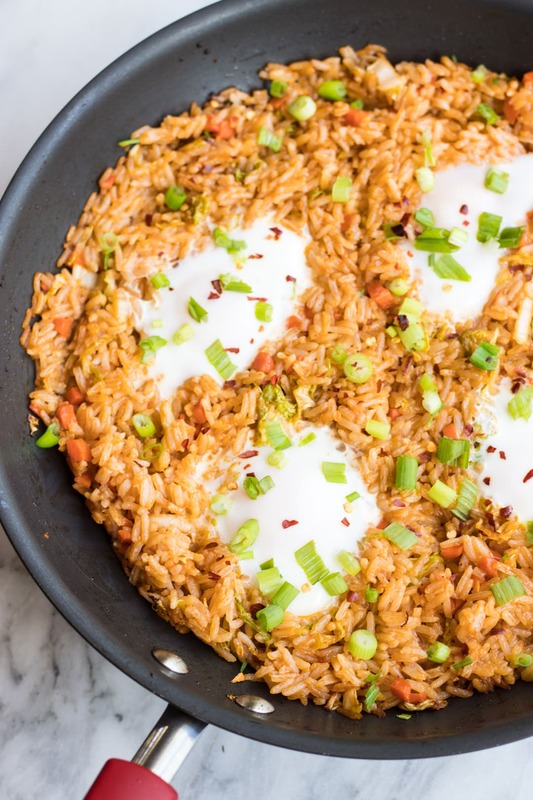 If using eggs, create four wells in the rice mixture. Carefully add a cracked egg into each well. Cover and cook until rice is hot and eggs are cooked to desired doneness. You may need to reduce heat to prevent rice from burning. Serve warm with cucumber slices and lime wedges and garnish with sliced green onions (green parts only) and optional red pepper flakes. Red Pepper Flakes: Chiles and peppers contain capsaicin a naturally-occurring compound that contributes to their spiciness. Capsaicin may be a non-FODMAP trigger for some individuals. Vegan/Vegetarian Friends: Omit the fish sauce and replace with a little bit of salt, to taste. Add or omit the eggs based on your lifestyle. Serving this with cooked tempeh is a delicious vegan alternative and was frequently how I enjoyed this dish in Bali. ? This Nasi Goreng looks perfect!! Yummy!